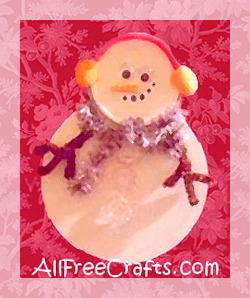 Recycle a CD and a juice can lid in this Christmas craft to make a snowman ornament. 1. Spray paint the CD and a juice can lid on both sides in white paint. Let dry. 2. Glue the eyes, and a small triangular piece of craft foam for the nose, to the juice can lid. Make a series of dots with black permanent pen to represent the snowman’s mouth. 4. Cut a length of red chenille stem to fit around the top of the juice can lid, extending down a little less than halfway. This is top of the ear muffs. Glue a small pom pom on each end of the chenille stem to finish the ear muffs. 5. Glue the completed snowman head on top of the CD. 6. Tie yarn, cord or a small strip of fabric around the neck as a scarf. 7. Cut a brown chenille stem in quarters. Take two pieces and twist one around the other to form a stick arm, as shown on the photo. Repeat to make the other arm. Glue the arms in place on each shoulder area. 8. Glue three buttons down the front to finish. If desired, add a loop of cord to hang.